Shrinathji is a Hindu deity and a form of Lord Sri Krishna, manifest as a 7 year-old Balak or child. Shrinathji is the presiding deity of the Vaishnava sect, referred to as the Pushtimarg (the Path of Grace), also known as the Vallabh Sampradaya or Shuddhadvaita, originally established by Shri Vallabhacharya. 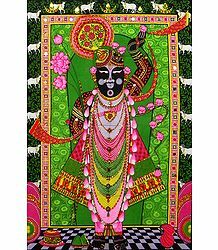 Shrinathji is worshipped according to the Bhakti Yoga tradition, by the Vaishanavites in Gujarat and Rajasthan. The main temple of Shrinathji is located in the temple town of Nathdwara, which lies about 48 kilometers from Udaipur in Rajasthan. The son of Vallabhacharya, Vitthal Nathji, was the one who institutionalized Shrinathji worship at this temple. Due to the immense popularity of the deity, the town itself is referred to as Shrinathji. Originally, the child deity was addressed as Devdaman, the Conqueror of all Gods. According to Hindu mythology, the child Krishna had lifted the Govardhanagiri of the Govardhana hill, in order to subdue Indra, the King of the Gods. Shri Vallabhacharya later named this Lord as Gopala and the temple as Gopalpur. However, Vitthal Nathji finally named the deity as Shrinathji. Early references to Shrinathji are found in ancient religious texts and literature. Most important of these is the instance where the Lord lifts the Govardhana hill with the little finger of his left hand, in order to protect the residents of Vrindavan from the arrogant wrath of Indra. This reference also features in the Giriraja-khanda of the Garga Samhita, wherein the Lord is addressed as Devadaman Shrinath. The followers of the sect of Pushtimarg believe that the Lord’s arm and face emerged from the Govardhana hill. Ever since, the Brajvaasis (the locals in that area) started the worship of Gopala, under the spiritual guidance of Madhavendra Puri. 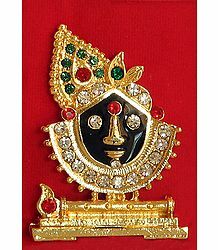 Hence, Madhavendra Puri is attributed to the discovery of the Lord Shrinathji. The deity was earlier worshipped in a small shrine at Jatipur village near Govardhana. Later, it was moved to a much larger temple atop the selfsame hill. It is believed that the Lord directed Shri Vallabhacharya to build the temple at Govardhana. Shri Vitthal Nathji continued then continued this tradition of worship. After having been worshipped in a temple at the Govardhana hill, the idol of Shrinathji was shifted along the river Yamuna and was even kept at Agra for some months. Then, in order to protect the idol from the rising Mughal empire, it was finally transported further south, in a chariot. When the idol reached the village called Sihad or Sinhad in Mewar, the wheels of the chariot sank into the mud and refused to budge from there. The priests realized that it was the desire of the Lord himself that a temple be installed in that very area, which was then under the rule of Maharana Raj Singh of Mewar. This temple was repeatedly attacked by the Holkars of Indore, the Pindaris and the Medas. In order to protect it, the idol was shifted yet again to Udaipur and was protected by Maharana Bheem Singh of Mewar. The temple at Sinhad, where the chariot got stuck in the mud, was built in the 17th Century. This temple is popularly referred to as Shrinathji ki Haveli, meaning, the House of Shrinathji. It was called thus because it resembled a regular household, containing a chariot for movement. The original chariot which was used to transport the idol is believed to have had a Doodhghar (store room for milk), Paanghar (a room to store betel), a Mishrighar and Pedaghar (a room to store sugar and sweetmeats), a Phoolghar (room for flowers), a fully functional Rasoighar (kitchen), a Gahnghar (to store ornaments), a Kharcha Bhandar (treasury), a Chakki (grinding wheel) and even an Ashvashala (stable for horses and chariots). The priests and the servers of the temple are not paid salaries. They receive the temple Prasad in reward for carrying out their duties. The idol of Shrinathji in the temple of Nathdwara portrays the child Krishna lifting the Govardahana Giri. His left hand is shown in a raised position, with the right fist clenched and resting at the waist. A large diamond is placed just beneath his lips. The idol itself is carved out from black marble. The deity is decorated with intricately crafted jewels, many dating right back to the pre-Mughal era. Near the main idol are carved figures of three sages, two cows, one lion, one snake, one parrot and two peacocks. The Lord is draped with rich silk and zari embroidered clothing. The deity is treated as royalty and is respectfully addressed as Thakurji. Followers believe that Shrinathji would one day ultimately return to Govardhan. The Nathdwara temple celebrates about 3 festivals a week. There is an interesting ritual of conducting darshans 8 times a day, at specific times each day, each darshan signifying one aspect of worship of the Lord. Due to the joint influence of the Krishna cult and the Pushtimarg as propagated by Shri Vallabhacharya, the rituals evolved to become very elaborate and complex, comprising many elements of worship within itself. The 8 aarti darshans are particularly beautiful and attract great crowds of devotees. The idol of the deity is treated like an actual, living child and is adorned with suitable attire at each time of the aarti, be it day or night. The prayers are offered along with lamps, flowers, fruit and other offerings. Devotees sing in praise of Shrinathji, with instrumentalists playing along with them. Each aarti has a certain set of songs to be sung with it. The Lord is then revealed in all his splendour, as the parda or curtain placed in front of him is removed. This view is called the “jhanki”, which literally means, “glimpse”. The priests working in the Haveli are said to be direct descendants of Vallabhacharya. This is also prevalent in all the Havelis around the world. The people establishing these shrines and formally offering worship are all believed to belong to the kul (dynasty) of the acharya. The shrine especially attracts large numbers of devotees during particularly Vaishnavite occasions such as Janmashtami, which marks the birth of Lord Krishna; Holi, Diwali and so on. Legend has it that the Gopis living in Braj used to love Krishna so intensely that they would try and make up just about any excuse to go over to Yashoda’s place to get a glimpse of their beloved Nandgopal. Yashoda, being highly protective of Krishna, would often be concerned about the Gopis wandering around her house at all times of the day. Hence, she decided that they could visit him only at particular times of the day – after he finished eating or as he was resting and so on. Based on this belief, Vallabhacharya stipulated that his Lord would give his devotees darshan at particular hours in a day and decided on 8 times per day, when the doors of the sanctum sanctorum would be opened for devotees to have a glimpse of the Lord. This is the very first darshan of the day. Shrinathji is gently woken up with the sound of the Shankha or conch, being blown in the background. This darshan lasts up to a time period of 45 minutes. This time may vary with each different season. Darshans start a little later during summer; the reason being that the Lord plays for longer with his friends in the hot weather, and so, he would need more sleep to get back his energy. Child Krishna’s adornment is also simple at this time of the year. He wears a thin adbandha. He is also not given his flute, as others would forget everything else and stop doing their work if he started playing his instrument. During the winter season, he is put to sleep earlier and so, is woken up earlier as well. In this season, he is covered up with a thick rajaai or blanket and only his face is visible to devotees. There is a sigri or fire lit before him, so as to keep him warm. Milk, mishri, buttermilk and sheera are considered to be Shreeji’s favorite bhog (eats). The Mangal Bhog Sheera is hence one of the most common items made for Prasad. An elaborate aarti is then performed to attain the Lord’s blessings. This dou vat batti aarti or aarti with two standing wicks, is performed with seven full and seven half rounds. It is believed that all his little friends would come to visit this beautiful aarti. Songs composed by the poet Shri Parmanand are sung during this darshan. The Shringar aarti takes place after about an hour from the Mangala darshan. Here, Shrinathji is dressed up and ornamented beautifully, in accordance with the particular season and time of the year. Interestingly, the Lord’s attire and jewelry he would wear on each day of the year had been fixed by Gusianji about 500 years ago. That same tradition is followed even today. Hence, the Lord never wears the clothing he has worn once that year. In this aarti, the Lord is offered garlands of flowers and a pink lotus is pinned at his waist. He is also seen with his flute in this aarti. After his Shringar is done completely, he is shown a gold mirror, so that he can be pleased with the way he looks. This ritual of showing him the mirror is believed to be the most important moment of the entire darshan, with devotees thronging to have a glimpse of this wonderful sight. Shreeji appears to be happy and proud, standing tall, as if appreciating his own good looks. This darshan has no aarti. A bhog of dry fruits and sweets is offered to him during this darshan. Keertans and bhajans (devotional songs) of the poet, Kavi Shri Nand Das is sung at this time. The Gwal darshan comes one and a half hours after the Shringar darshan. This darshan is usually not open for the public during special occasions and festivals. During this darshan, the cowherd Nandlala is believed to be taking his cows for grazing. The leaves of the Tulsi plant are offered to the Lord and a Dhoop Dhunni is carried out, so that he is not affected by the evil eyes of others. Again, the dou vat batti aarti is performed, followed by a bhog of milk, kheer, rabdi and so on. Keertans of Kavi Shri Govind Swami are sung at this darshan. This is the fourth and the most impressive darshan of them all. Just before this darshan opens to the public, the priest loudly asks the sevak (helper) to bring Shreeji’s garland. The Lord’s garden is believed to have been at a little distance, and hence, the priest beckons the sevak to hurry up with his job. This very elaborate darshan is open for longer than all the other darshans. Then, Shivji is called for, asking him to take a darshan of the Lord. The idol of Shivji was also installed in a temple near the Banas River, when Shrinathji shifted to Nathdwara. It is believed that Shivji too participates in the Rajbhog darshan, within a round semicircular area, just in front of Shreeji. Hence, no one else is permitted to step into this area at the time of the Rajbhog darshan. The Lord is adorned with a new garland and he is seen with his flute. Triangular betel leaves are offered to him, followed by an elaborate aarti. He is offered all types of food that make up for a royal lunch befitting his exalted status. The Lord’s food is always sweet and no spice is added to his food. His drinking water, which is fragrant, is always mixed with rose water, kesar (saffron) or sandal essence. Milk mixed with saffron is believed to be his favourite drink. Songs composed by the poet Shri Kumbhan Dasji are sung for this darshan. After his darshan, the Haveli is shut for the entire afternoon, since he has to take his vishram or rest. The next darshan takes place only after 3 hours, after the Lord is done with his siesta. This is the first darshan of the latter part of the day. The darshan starts at around 3:30pm and goes on for 45 minutes. Here, Shreeji is woken up with the soothing sound of the Veena. The child Krishna is still a bit groggy after waking up and so, the environment in the Haveli is calm and peaceful at this time. A bhog of fruits and milk products are offered and devotional songs of poet Shri Surdas are sung in praise of the Lord. After about an hour after the previous darshan, there is the Bhog darshan. During the summer season, little fountains are started in order to cool the environment. In winters, a coal sigri is lit in order to provide adequate heat to Bal Krishna. 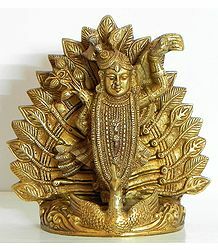 A golden fan made of peacock feathers, called morchadi, is waved around the idol of the deity. This darshan also includes a flower shringar or flower bangala. Later, a bhog of fruits, a few light snacks and Thor is offered to the Lord, along with keertans of poet Shri Chaturbhuj being sung during the darshan. This darshan comes immediately after the Bhog darshan. It relates to Yashoda doing an aarti for her divine son. The deity’s clothing here is light and soft, as he is preparing for bedtime. The child Krishna is given his flute and so, everything around becomes serene and quiet. In this darshan, Bhog is also offered to the Sudarshan Chakra. Keertans of Kavi Shri Chitta Swami are sung at this time. The Shayan darshan is the last one for the day. As the name suggests, this darshan is to put the child Krishna to sleep. Here, the sevak goes out on the terrace to call out to the chief chef to report early next morning for work. The playing of drums signify the opening of the darshan. A melodious bhajan is sung in the form of a lullaby. Shreeji is given his flute and the Veena is played for some time. A lush rich carpet is spread out, leading all the way to Shreeji’s room. In the room, a gold bed is made ready for the Lord to rest on. It is believed that Radha would also join him, and so, her apparel and ornaments are also kept ready. A bhog of water, laddoos and paan (betel leaves) are kept ready for him. Keertans of Kavi Shri Krishna Das are sung at this darshan. Being the last darshan of the day, it becomes dark and silent all around, till Krishna is woken up again the next morning for giving his first darshan. The wooden platforms from the “Dolti Bari” of the main audience chamber and the doors to the “Sinh Pole” – the huge door guarded by tigers – are left open for the night. Since the child Krishna is asleep, there are no chances he will run out from the gates and hence, it is considered safe to keep them open! Not only the temple, but the entire town seems to retire into an attitude of quiet as soon as Shreeji is put to sleep. All of the Lord’s Bhog is prepared in the Nij Mandir, in accordance with the different seasons. 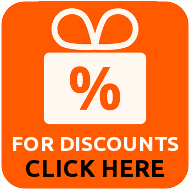 Even the choice of foods, spices and dry fruits to be used is based on the season it is offered in. While most of the food is sweet, there is a minimal addition of rock salt and pepper in some dishes. In the heat of the summer, he is offered cooling Rose water and sandalwood, while he is given Kesar or saffron to warm him in the winters. Only the purest of ingredients are hand-picked and used to prepare the Bhog. Also, no one is allowed to watch as the Lord partakes of his meal. While the bhog is a feast for the stomach, the shringar or the ornamentation of the Lord is a veritable feast for the eyes! Shrinathji’s shringar is very aesthetic, artistic and screams of opulence. He is bedecked in all conceivable types of jewelry, again in keeping with the day of the year and the season. The flowers used to decorate his person are grown especially to offer seva to him, are plucked freshly and are gathered early every morning from various gardens. There is a separate room where sevaks prepare the garlands for him. The flower shringar can be performed only by the Mukhiyaji (chieftain) or other people authorized to do so. Just like during bhog, no one is allowed to watch as the Lord is dressed up before his darshan. Shrinathji’s clothes are never used a second time. There is a team of darjis or tailors who constantly create beautiful apparel for the Lord. It is believed that if the child God does not want a particular set of clothes, he would indicate his refusal. In case he “refuses” the garment three times, the item is kept away, never to be used again. An alternate set of clothes is always kept ready for him, in case he rejects what the sevaks drape on him. Hindu temples usually remain open for a fair amount of time everyday. But this is not the case with Nathdwara. Since Shrinathji is a child God, he is given enough play and rest time during the day, when he should not be disturbed. Darshan timings are hence regulated, with a possible variation of about a half hour, in accordance with the different seasons. During occasions and festivals, the darshan timings are lengthened, so that all devotees can get a good glimpse of the Lord. He is woken up at a particular time each day, is bathed, dressed and offered food. He then gives brief darshans, after which he is sent off to play. He is given lunch and is then put to sleep for a while, so that he can refresh himself. After waking up, he is offered a light snack for the afternoon. After his evening darshan, he is given a light meal and is prepared for bedtime, to be woken up only the next morning for darshan. Since the child Krishna would not want to be disturbed all through the day, the temple opens only for the 8 darshans or jhankis and remains closed at all other times. Govardhan Parvat has eight doors in all. Each door signifies the location of Shreeji’s Ashta Sakhas or 8 Gwal friends. These poet friends of Krishna wrote several songs and bhajans in praise of the Lord, each of these songs depicting a different bhava or rasa (emotion). These are still used in the same order during each darshan in the Nathdwara. Shrinathji gives his darshan to all his devotees and constantly bestows good upon them. While the Lord goes about uncomplainingly with his unending routine, it becomes the duty of the bhakta (devotee) to approach him with purity of heart and bhava. It is important for devotees to move in the company of sadhus and spiritually higher souls and also focus their mind entirely on the darshans. Associating with satsangs (spiritual groups) is also advisable for devotees, as it helps to silence their minds and elevate them to higher planes of existence. While it is impossible not to get distracted by the rich clothing and jewelry of the Lord, it would highly benefit devotees to finally focus on his beautiful, benevolent face, radiating love, peace and grace. For those who are pure of heart and compassionate, the child God is said to respond with an equal amount of love and bestows much good upon their lives. 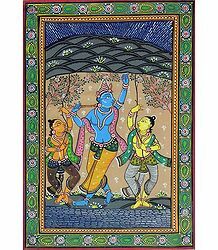 Pichhwais are colourful and intricate paintings of Krishna. These can be found in abundance in Nathdwara. Pichwai artisans use the medium cloth, paper and temple wall hangings to portray various aspects of the Lord, depicting him in different body postures and moods. This exclusive art form is passed down from generation to generation. Pichwai artists can be found residing mostly in the Chitron Ki Gali (Street of Paintings) and the Chitron Ka Mohallah (Colony of Painters) areas and are predominantly found to be working in close groups, under the supervision of a master artist. The major purpose of these artisans is to narrate the tales of Lord Krishna to illiterate locals. While this art is much in demand in India, it is also very sought-after by foreign visitors and has also emerged as the main export of Nathdwara. Shrinathji temples can be found all around the world. Gaudiya gurus have in fact established the Lord’s temples in certain regions of Pakistan, Russia and of Central Asia as well. 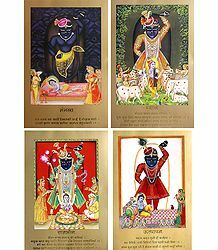 The United States houses many Shrinathji temples in the states of New Jersey, Lowell, Massachusetts, Parlin, Connecticut, New Haven and so on.